The Standard PHP Library is already a few years old, but recently the library has gained a lot of popularity among PHP developers. With more complex applications and more data to process, the library’s many functionalities can make development more efficient and easy. However, one of the major problems of the SPL is the fact that the documentation falls behind the rest of the PHP documentation. This book covers all the facets of the library and gives you some background information where needed. Everything is accompanied with examples to give you an idea on how to use it in practice. After reading this book, you will be set to use the SPL interfaces, data structures, and of course, the iterators. 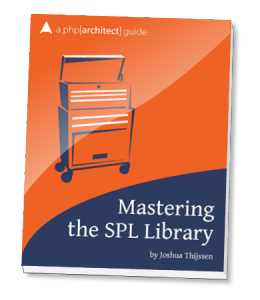 Mastering the SPL Library is a book for those curious about how to start with the Standard PHP Library and for those already familiar with it who wish to learn the ins and outs of its more advanced features. With its detailed information, this book serves as a great reference for all that use the SPL and is one of those books that should be on a developer’s desk at all times. Bought this when it first came out, a great book, especially as the SPL is so underrated IMO, primarily due to lack of documentation.